Q. It seemed you found a way in the second set, and then it totally went away in the third. What was the sensation today? How can you explain how it went? RAFAEL NADAL: No, in general, I played some good games at the beginning, bad games at the end of the second set; some good games on the second; not bad at the beginning of the third. But he played well the third, so he deserved to win more than me without any doubt tonight. Just congratulate him for the victory. Q. Do you feel that you haven't been able to build up much momentum this season? 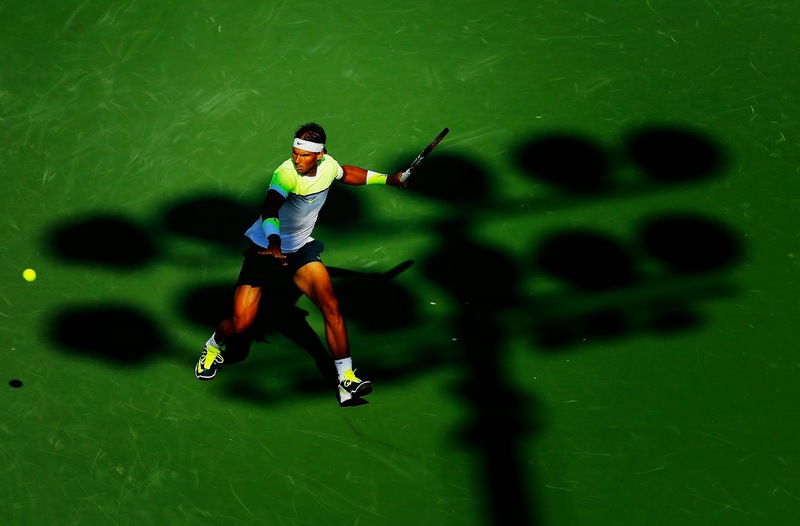 RAFAEL NADAL: It's not the question of tennis. The thing is the question of being enough relaxed to play well on court. Something that if I tell you one month ago or one month and a half ago I didn't have the game. Today my game in general improved since a month and a half. But at the same time, still playing with too much nerves for a lot of moments, in important moments, still playing with a little bit of anxious on that moments. For example, in the 4-3 in the first set, and then in the 5-4, 30-Love. Something that didn't happen a lot during my career. I have been able to be under control, control my emotions during, let's say, 90%, 95% of my matches of my career, something that today is being tougher to be under self-control. But I gonna fix it. I don't know if in one week, in six months, or in one year, but I gonna do it. Q. You obviously had quite a few issues last year. I think your wrist, your back, and the appendicitis. I'm just wondering if you're finding it as easy to trust your body perhaps after those problems last year. Q. Is it an issue maybe trusting your body this year after all the physical problems last year? RAFAEL NADAL: No. The physical problems are past. I am on competition. I'm playing weeks in a row. Is not an excuse. What happened last year, yes, the first weeks of the season obviously all the problems that I had didn't help, but talked enough about these kind of things. Is different story today. As I said before, feeling much more comfortable in my tennis, practicing well, much better than in Australia, much best than Rio de Janeiro and Buenos Aires. But still playing on competition, you know, feeling more tired than usual, feeling that I don't have this self-confidence that when I hit the ball I gonna hit the ball where I want to hit the ball, to go for the ball running and knowing that my position will be the right one. All these are small things that are difficult to explain. One of the tougher things have been fixed, that is the game, in my opinion. Now I need to fix again the nerves, the self-control on court. That's another issue. Is not a tough issue to fix, but I gonna keep trying. I am trying my best. I am practicing with the right attitude, I think. I arrive in an important part of the season for me. I didn't want arrive to that part of the season with that loss of today, obviously, but that part of the season arrives. It's the next for me, and I am excited. I am enough motivated to keep working hard, and that's what I gonna do. The tournaments that are coming are tournaments that are historically good tournaments for my game, good tournaments for my confidence. Is true if I'm not able to control all these things, I don't gonna to have the possibility to compete well and have have success on that events. But still with confidence that I can do it. Q. I think it's very interesting you're talking about nerves and self-control. I mean, you seem like you have won so many big matches in your career that you always seem to have that confidence and that swagger about you. Why do you think this has happened? When did you start feeling that way? RAFAEL NADAL: It happened when I came back. Beginning of the season I am playing with, you know, all these feelings that for moments are new. You know, I am not saying that didn't happen in the past because happened, but happened for a very small -- for one point, two points. Happened, and then (snapping fingers) I'm able to say, Okay, I am here. But now, for example, happened for, you know, 3-All break point, more or less easy forehand. That was a very important point for me, but shouldn't be that important, you know. I lost that point, and then affects to the next game. I am playing with the next game with more nerves. Then I had the break back, 30-Love, and then again I miss a forehand. That created me doubts again. So a little bit on and off, on and off too much. That's something that didn't happen in the past, no? I'm trying to be honest. I am saying the things that I feel today. But at the same time, I tell you that I have been able to able to change a lot of situations, a lot of negative situations in my career, and I want to do it again. Gonna work to do it again. I am confident that I can do it. I don't know if I gonna do it, but I hope I can. Q. Have you ever felt this kind of nervousness or lack of self-confidence before in your career? RAFAEL NADAL: I said yes. I said before yes. But not for, let's say, four games in a row, no? Happened for two points and then I was able to be back and to forget about that two mistakes. Now takes a little bit more time. For example, I was able to be back on the match today, but between 5-3, 4-3, and 2-1, break point for him, I was not there, you know. And I was not there not because I didn't want to be there, no? Because I was with negative attitude being there. Because I was playing with too much nerves. I was anxious on court. It's not the thing that, you know -- well, is not like maybe some players happen that four games because they lost the concentration and they didn't have the right attitude there. Is not my case, no? Is not my case. I wanted to be there. I tried in every point, but I was not able to relax myself, calm myself, say I'm going to play my tennis now. Q. As this is a problem in your head, if you like, have you thought about consulting a sports psychologist? Many top golfers say the sports psychologists were very, very important in recapturing their game and getting over these problems. Are you thinking about doing that? RAFAEL NADAL: Seriously, I said a lot of times in my career that tennis is not a big deal in life. (Smiling.) You know, medical treatment you need when you have problems. Outside of the tennis world when you have some problems in your life, is a good help that you visit a professional that can help you to improve your quality of life. Is sport, is game. That's not that much important. But I don't know. I didn't think about. Is something that I need to fix for myself and with my team. I need the help of my team, too. But especially I need the help of myself. That's what I am trying to do. Nobody gonna change the situation for you. You have to know that you have a problem and you have to know that you have to improve that. You have to change that. I gonna keep working on it. Hopefully the clay helps. Is obvious that if I am able to win my matches on clay, to feel my game confident there, then the doubts are less. Q. With the clay season coming up now, are you looking forward to that as an opportunity for you turning your season around, hopefully getting some confidence going into the last stretch of the season? RAFAEL NADAL: (Shaking head.) I am not American. I cannot understand you if you speak that fast. (Laughter).